Queen and Adam Lambert will make an announcement at a scheduled press event at New York’s Madison Square Garden on Thursday, March 6. Based on recent comments by guitarist Brian May, it is anticipated that the pairing will formally announce a series of US concert dates for this summer. 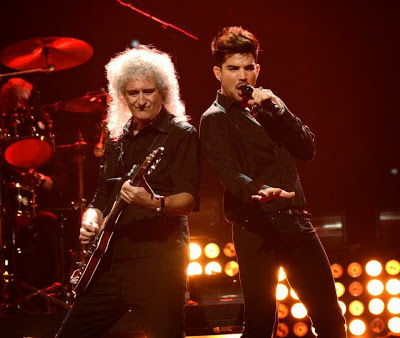 "We've been talking to Adam Lambert, you know we've already done some gigs with Adam, who is amazing," May recently told BBC Radio 2 host Steve Wright. “We are ongoing, we can't help it. I think we all protested too much in the sense when Freddie went and we didn't want to talk about it and didn't want to be Queen for a while." "But after a while,” he continued, “you realize that people wanna hear the songs and see us do things. So, no matter what you call it, Roger and I do do stuff, and I think we'll be doing some more stuff this summer in fact, probably in the States." Queen have previously toured Europe with Lambert, the former American Idol contestant, and played the iHeart Radio Music Festival in Las Vegas last fall.